I've been backpacking for nearly half a century, most often in the Rockies. I do at least one weeklong trip every summer, and often take three-day trips. I'm usually camping in alpine terrain, at altitudes 5000 to 10000 ft (1500 - 3000 m). I prefer base camp backpacking, a long hike in with day trips from camp. Though always looking for ways to reduce my pack weight, I still tend to include my favorite camp conveniences. I always sleep in a floored tent and like hot meals. Summer trekking often focuses on fly-fishing opportunities. A spray bottle of Footwear + Gear Cleaner [275 ml/9.3 fluid ounces; weighs 10.9 oz/309 g]. "Recommended for use on all fabrics, including those with Gore-Tex and eVent linings." A spray bottle of Footwear Repel [275 ml/9.3 fluid ounces; 10.9 oz/309 g]. A tube of Leather Conditioner for Full Grain Leather [75 ml/2.5 fluid ounces; 2.5 oz/71 g]. A hard-bristle wooden brush [7.5 in/19 cm long, 2 in/5 cm wide tapering to a point at one end; 2.0 oz/57 g]. The Gear Cleaner and Repel are water-based and bluesign approved. The two spray bottles have abridged instructions for use in small type on the bottles but refer users to "full instructions" online, which are provided in illustrative and informative videos. The tube of Leather Conditioner has something in even smaller type but also has a video on the website. The following summary comes from the videos on the Grangers website. 1. Clean the footwear in question. The Gear Cleaner is said to be appropriate for all kinds of leather or fabric. First brush of all surface dirt with a cloth or brush, then spray on the Cleaner all over from 10-15 cm [4-6 in] away. Rub in with a clean cloth. 2. Spray the Repel on damp footwear from the same distance, making sure to cover all seams. Rub in with a clean cloth. Allow to air-dry. 3. For full-grain leather footwear, apply the Conditioner directly to the leather surface and rub in with a clean cloth. In other words, proceed logically - first clean, then treat. 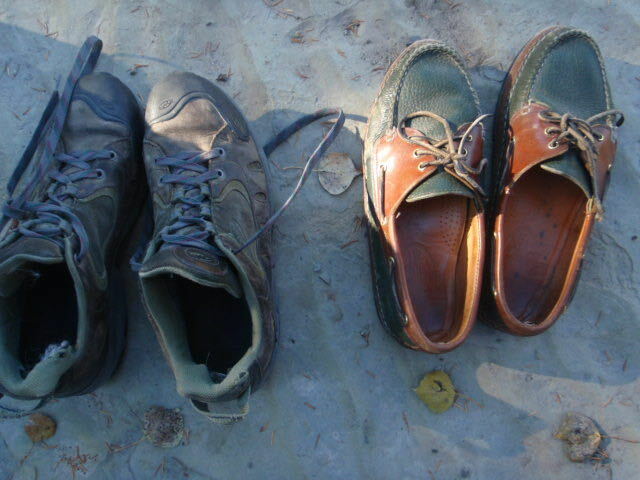 From an ample supply of shoes in dire need of a cleaning I selected the initial guinea pigs: a pair of Oboz Bridger Low Waterproof boots, pictured at left, and a pair of full-grain leather casual shoes, pictured at right. The latter were selected specially to test the Conditioner. Both are several years old and I can't recall when I last cleaned either set. After brushing off the surface grime I sprayed the victims with Gear Cleaner, rubbed that in with a damp cloth, then sprayed them with Repel, rubbed that in with a dry cloth. Four hours later all were dry, and I rubbed Conditioner into the casual shoes. At this point I only can report on surface appearance, which was good. Both pairs, the casual shoes in particular, now look much cleaner. The products are easy to use and easy to store. I promise to use them up as I prepare for winter. My Initial Report ends here. Please check back in two or three months for my Long Term Report, in which I shall have the data on weather resistance and durability. My thanks to Grangers and BackpackGearTest.org for this testing opportunity. I've made good use of this cleaning kit over the past two months. 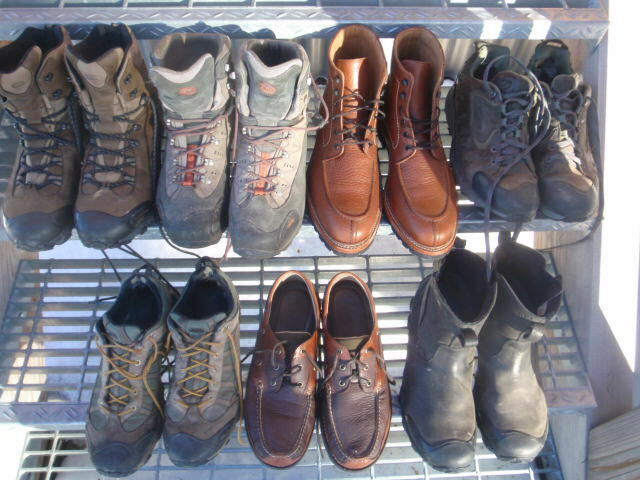 The guinea pigs have been primarily five pairs of Oboz shoes and boots: the shoes pictured on the left in my Initial Report, a second pair of trail runners made of leather and synthetic, my Bridger 8" Insulated boots [tested on this site], plus two pairs of leather street shoes [i.e., used in the front country]. All are pictured below. 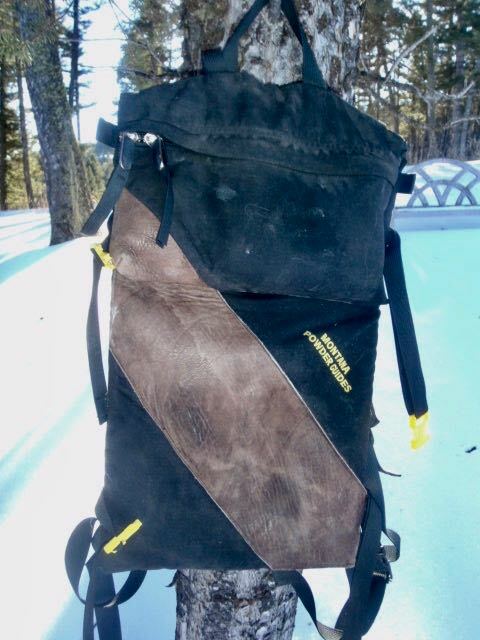 I have a day pack that I use for backcountry skiing that has a full grain leather strip across the front. I treated this last week as a tune-up for use this winter and spring. I used the Gear Cleaner and Repel on the entire pack [leather and Cordura], the Conditioner on the leather only. The weather in the Northern Rockies has assisted considerably in using up the Granger products. Autumn was wet, followed by early snow, in turn followed by a three-week dry spell with temperatures warm enough to melt the snow. The result - mud everywhere, in the dog parks, on the local hiking trails, on my unpaved driveway, on the unpaved roads that are my most frequent venues for my daily walks with my Golden Retriever. My boots or shoes were constantly muddy and thanks to this Test cleaned far more often than usual. It was a rare week that at least one pair of outdoor footwear didn't undergo treatment. In these conditions I wear the front country shoes only for special occasions, but each was treated at least twice. I estimate working over at least thirty pairs, and I used the brush on many more. 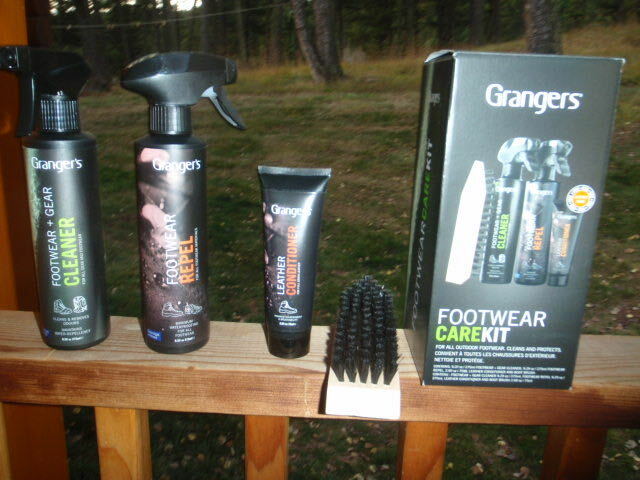 The Granger Footwear Care Kit does what it's advertised to do. All four products are easy to use and accomplish their stated mission. Here's how I use them. Step One is to brush off the accumulated dried mud with the brush. The brush's hard bristles and good old-fashioned elbow grease whisk off dirt efficiently from all areas of footwear, including some hard-to-reach slots and crevices such as the teeth on the soles and the upper base of the soles where they are stitched to the body of the shoe. The brush works so well that I use it on the soles of plastic boots as well as the targets of the leather treatment products. Then I swab the leather surfaces of the shoes or boots with a damp cotton cloth and immediately wipe away surface water with a dry cloth. Then I spray on the Footwear & Gear Cleaner and rub it in using the second [dry] cloth. This I repeat with the Footwear Repel if the target footwear has factory-provided waterproofing, as do all pairs of the backcountry shoes. With the Big Sky boots [on the lower right in the photo], the only full grain leather product in the backcountry bunch, I'll give the sprays a few minutes to dry and then rub in the Leather Conditioner, wiping away any excess remaining after the rubdown. Both front country pairs [they collect mud too], entirely full grain leather, get the Conditioner. All this takes very little time; in fact the most time-consuming exercise is cleaning off the footwear with the brush. After that it's not much more than a couple of minutes. I've had no jams or other problems with the spray bottles. All products are stored together in my heated garage at about 40 F [4 C], which also serves as the operating room. The Leather Conditioner is the only product on which I have noticed a marked improvement on its subjects over the past four months. All footwear that I've treated with this, the Big Sky boots in particular, are more supple and less prone to drying out thanks to treatment with the Conditioner. That's not to say that the other products haven't performed just as well; it just hasn't been so noticeable. All remain waterproof and I expect that regular treatment will prolong both the manufacturer's and the Granger products' waterproofing. The pack is definitely cleaner, as the recent application removed a couple of longstanding stains on the leather strip. Of course some of the good results come from adding regular cleaning and treating to my weekly routine but what I have sprayed on and rubbed in have contributed as well. I'm pleased that the Grangers Care Kit is now in my gear closet. It's useful and efficient on everyday footwear as well as backcountry gear. The brush in particular is a definite winner. My Test Report ends here, with thanks to Grangers and BackpackGearTest.org for the introduction to this excellent set of products.